» home » magazine » 2015 » november 2015 » italian metal-fabricating trade mission: fantastico! That’s precisely what Italian machine-tool manufacturers are doing, as evidenced by recent survey data from UCIMO. The Italian association represents manufacturers of machine tools, robots, automation systems and ancillary products. In 2014, UCIMO reports that production by Italian equipment manufacturers grew by 7.9 percent, and it predicts production to grow another 5.2 percent in 2015. Exports to foreign markets, while down in 2014, have rebounded this year, as evidenced by a 2.1-percent uptick in sales for Q1 2015 compared to 2014. Costam Hi-Tech employs this 500-ton robot-tended press—with visual-inspection station between (see the lightbox)—to stamp parts weighing as much as 10 kg. Shown are large parts stamped for equipment used in textile production. At each stop along the way we learned of new developments in press, laser-cutting and metalforming technology—some slated for display at FABTECH 2015 in Chicago. And, we were able to witness firsthand how several Italian metalformers and fabricators leverage state-of-the-art technology to improve productivity and quality. Through a partnership with Bruderer Machinery Americas, SanGiacomo Presse (Vittorio Veneto, Italy) launched Sangiacomo Presses Americas in 2014, based in Huntsville, AL. By the end of 2015, the company expects to be fully operational in Huntsville. Andy and I met with area representative Tobias Prataviera for an update on the firm’s press technology, and for a tour of its nearby customer, job-shop stamper/fabricator Costam Hi-Tech S.r.l. SanGiacomo manufactures mechanical C-frame presses from 10- to 450-ton capacity, and straightside models from as little as 50 tons (popular for precision work for specialty manufacturers such as watchmakers) to large 500-ton models used throughout the European automotive supply chain. A glimpse at the firm’s catalog shows, for example, that a 500-ton straightside press offers automatic stroke adjustable from 0.9 to 9.8 in., and a 50-ton model offers a manually adjustable stroke of 0.5 to 4.3 in. In addition to conventional stamping applications, Prataviera notes that the firm’s presses find great acceptance throughout Europe for rollforming applications, performing pre-punching operations, and for fabricating metal closures. And, as noted, its smaller straigthtsides have become popular among companies serving the watchmaking industry, where special press features have been developed and implemented by SanGiacomo to meet that industry’s unique needs. Real-time bend-angle control with Prima press brakes comes via Lazer Safe technology, and that technology recently shot to a new level of performance with the introduction, in 2014, of Lazer Safe’s Iris product. The Iris (integrated real-time imaging system) optical setup collects and processes images in real time during bending and transfers the data to the press brake’s CNC. Aside from specialty markets such as rollforming and watchmaking, it’s the big Tier One automotive suppliers throughout Europe (supplying Audi, BMW, Porsche, etc.) that keep the press orders coming for SanGiacomo. A quick trip up the road from SanGiacomo led us to job-shop stamper/fabricator Costam Hi-Tech S.r.l., in San Quirino, where we toured with chief of production and part owner Cervesato Graziano. The star of the tour was a 500-ton SanGiacomo straightside press tended by a pair of robots. We spied the robot-tended press, installed in April 2014, stamping 2.5-mm-thick steel parts for textile-manufacturing equipment. The robots index parts in and out of a two-station die. Between die stations, the robots move stamped parts in and out of a visual-inspection station. Here, a lightbox allows a robotically actuated camera to check part dimensions and hole locations. The robot then moves approved in-process parts back into the die for a second hit. “Two operators once tended this press,” says Graziano. “However, the blanks weigh as much as 8 kg (17.6 lb.) apiece, and finished parts weigh as much as 4.5 kg (10 lb.). The operators quickly became tired moving such heavy workpieces. With the robots, we can run more quickly and consistently, typically producing 110 finished parts/hr. Prima’s Laser Next three-dimensional five-axis cutting system is seen cutting a hot-stamped B pillar, of AHSS. Next we took a look at what Prataviera calls a “hybrid” press developed specifically for applications requiring high tonnage and small bed size. Costam uses the hybrid press to stamp parts for high-end De’Longhi coffeemakers. “The parts have to be aesthetically perfect,” notes Graziano. Costam stamps some 60 parts for the coffeemakers, which then it assembles into approximately 400 machines/day on a dedicated assembly line. We next visited the Prima Industrie bending-equipment facility, which manufactures approximately 100 press brakes/yr. in Cologna Veneta, near Venice. About one-third of the brakes travel across the ocean for U.S. installation. The 5000-sq.-m plant and its 200 employees also manufacture approximately 50 panel benders per year, as well as automated bending cells. In fact, earlier this year Prima celebrated the manufacture of its 500th panel bender at the facility. Welcoming Andy and I was Fabio Farina, press brake product manager, who in less than one year at the company already is announcing big technology developments soon to come. Prima manufactures three models of servo-electric press brakes, and sales have grown consistently in recent years, Farina shares. Coprauto, a prototype/production metalforming and fabricating job shop, employs a Prima Rapido 3D laser-cutting machine to trim stamped parts, enabling the company to expand its offerings to its metal-stamping customers and to attract new customers for prototype development. “Late this year and early into 2016, our family of press brakes will grow,” he says. “And, not only will we introduce new models, but new technology as well.” A tour of the manufacturing facility revealed two press brakes on the floor dedicated to research-and-development projects, some of which Farina dared to share. Prima soon expects to add automatic crowning to its press brakes, Farina explains, for applications where fabricators must form parts to a bend radius exceeding the typical 8:1 ratio of die opening to material thickness. Real-time bend-angle control with Prima press brakes comes via Lazer Safe technology, and that technology recently shot to a new level of performance with the introduction, in 2014, of Lazer Safe’s Iris product. The Iris (integrated real-time imaging system) optical setup collects and processes images in real time during bending and transfers the data to the press brake’s CNC. The control then digests the data to control bend speed and angle—active angle control for single parts or small batches, and dynamic angle control for high-speed processing of large lot sizes. It even permits, under certain conditions, according to literature from Lazer Safe, bending beyond the speed restriction of 10 mm/sec. 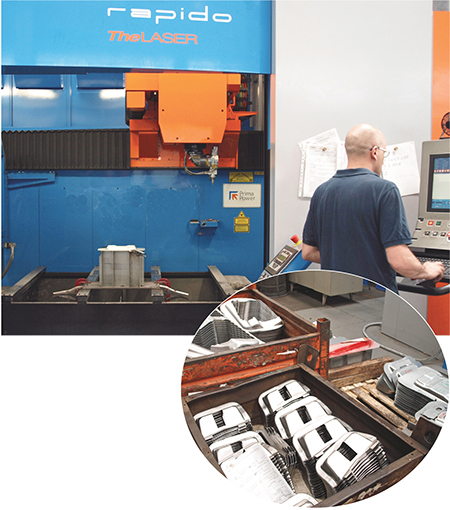 established by the European press-brake standard EN12622. Here, Iris looks at the angular velocity of the moving workpiece during bending so that when using a wider die opening a faster bending speed is allowed. Lastly, Farina notes that the firm expects to see a boost in sales of robotic-bending cells, particularly where fabricators form large batches of parts of similar sizes. “We see increased use of robotic bending in Asia,” he adds, “despite the region’s lower labor costs. “This is because production models there tend to be based more on mass production than in Europe or North America,” Farina continues, “where fabricators tend to run smaller batches and an increasing amount of product variability.” R & D efforts in this arena, says Farina, are focused on developing technology that more closely marries robot to press brake, to simplify integration and ease programming. Along with bending equipment, Prima also manufactures punching and shearing machines, laser-cutting machines and laser sources—CO2 and solid-state ND:Yag—as well as integrated automated systems. And, it sells cutting systems equipped with fiber-laser sources. As nearly half of its overall business relates to the laser-cutting market, that’s where Andy and I focused our visit to the headquarters location of this €350-million corporation. During our visit to Prima’s 350-employee facility in Torino, we learned of recent laser-machine design and development, as well as its application-support engineering services. Prima introduced two new machines to the market in 2014, and laser-sales support specialist and senior manager Massimo Sinopoli explained to us their significance to fabricators. Salvagnini’s P2lean panel bender has an expanded range of workpiece thicknesses and a smaller minimum flange dimension. Both features are designed to expand its range of applications. “Customers are rethinking how they can use a panel bender,” says Bello. First up was a look at the Laser Next 3D five-axis fiber-laser cutting system developed primarily for the automotive industry, specifically to address the fast-growing hot-stamping market. Customers are using the Laser Next to trim stamped advanced high-strength steel (AHSS) parts. Introduced to the global market at the EuroBlech 2014 exhibition in Hannover, Laser Next machines reduce cycle times by as much as 25 percent, says Sinopoli, compared to previous technology. The demonstration Andy and I witnessed put the Laser Next through its paces cutting a hot-stamped B pillar, of AHSS. To make a total cut of 1.5 m around the part periphery, the 3-kW took 42 sec. ; on the previous model of 3D-cutting machine, says Sinopoli, the same cut took more than 1 min. Also introduced last year was the Platino 2.0 Fiber flat-sheet cutting machine, with laser sources from 2 to 5 kW and highlighted by advanced piercing technology to optimize throughput. For piercing thin sheet, Prima offers the Smart Cut mode. Here, explains Sinopoli, the laser head need not pause when transitioning between piercing and cutting. It’s one smooth process and, he says, yields as much as a 30-percent cycle-time reduction compared to traditional piercing. For thicker sheet, fabricators will opt for the Max Cut pierce mode, featuring a hefty flow of nitrogen delivered to the workpiece material. This cooling effect reduces what can be a pierce time of 3-4 sec. down to less than 1 sec. Tecnolaser installed this Salvagnini Model L5 3-kW fiber-laser cutting machine early in 2014 to take over work from an aging 2.5-kW CO2-laser model. The firm fabricates 600 tons of galvanized and stainless-steel sheet per month, and finds that the fiber laser improves cut-edge quality on galvanized steel sheet. Sinopoli then led us to its customer, Coprauto, in San Valeriano, a prototype/production metalforming and fabricating job shop. It recently invested in a Prima Rapido 3D laser-cutting machine. As explained by Coprauto sales manager Andrea Rizzi, laser trimming of stamped parts has enabled the company to expand its offerings to its metal-stamping customers, and to attract new customers for prototype development. Coprauto has realized significant growth in recent years, says Rizzi. Since 2011 revenue has climbed by 50 percent, and company management has supported such growth by continuing to invest in new fabricating technology, including laser cutting. In addition to the Rapido machine, also new to the shop is its second flat-bed laser-cutting machine, a Platino model with a CV4000 4-kW CO2 resonator rated for mild steel to 22 mm thick, stainless steel to 12 mm and aluminum to 10 mm. It’s accompanied by a 10-shelf (3000-kg capacity per shelf) material storage tower and automated load/unload system, “to handle larger prototype orders and production runs,” says Rizzi, “which can require cutting as many as 2000 parts or more.” We spied the Platino CV4000 cutting 8-mm-thick steel parts, for machinery manufacturers in the medical industry. The new machine joined an existing Platino flat-sheet cutting machine that’s been a workhorse for Coprauto since 2008. Sinopoli explains the most significant difference between the two model years. We next moved on to Salvagnini, in Sarego, manufacturer of fiber-laser cutting machines, punching-shearing machines, panel benders and press brakes. Under the spotlight at its showroom, we saw the FlexCell, introduced at EuroBlech 2014. The cell, explains project manager Pierandrea Bello, uniquely combines a panel bender with an automated press brake. Flexibility is the mantra Salvagnini follows as it develops new metal-fabricating equipment—stand-alone machines and integrated automated systems. With more than 5000 installations in 75 countries, 2014 marked a record sales year (€281 million) for the company. And Bello, as well as Eugenio Bassan, CEO of Salvagnini America (who also attended our meeting), expect continued sales growth in 2015 and 2016. A walk through the forming-equipment showroom (a separate showroom is dedicated to laser-cutting equipment) of the 80,000-sq.-m facility (including 50,000 sq. 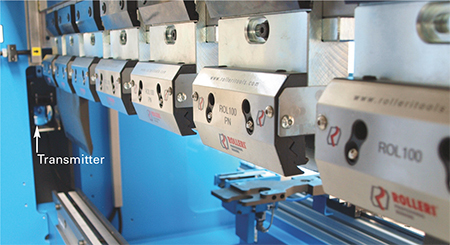 m dedicated to manufacturing) featured a look at the firm’s P2lean panel bender. Salvagnini introduced the P2lean at EuroBlech 2014 and will officially introduce it to the North American market at FABTECH 2015. “Customers are making parts in the P2lean that they never thought could be made in this type of machine,” Bello says. Compared to previous models of Salvagnini panel benders, the P2lean has an expanded range of workpiece thicknesses (to 3.2 mm in mild steel) and a smaller minimum flange dimension. Both features are designed to expand its range of applications. Maximum bend length is 2.2 m, and maximum bend height is 165 mm. The machine we saw was equipped with automatic bend adjustment, which reconfigures its tooling to prepare for the next bend as soon as the part is presented. “Customers are constantly finding new ways to use a panel bender,” Bello adds. The P2Lean is an intelligent machine that continually monitors bending and, when necessary, automatically adapts parameters to accommodate variations in thickness and material resistance to achieve the required bend angles. Salvagnini calls this standard feature MAC 2.0—material attitude calibration. The goal, explains Bello, is to produce quality parts from the very first piece. From Salvagnini HQ in Sarego we headed to the town of Curtarolo to visit metal-fabricating job shop Tecnolaser. The 15,500-sq.-m shop houses numerous Salvagnini machines including two large panel benders, several press brakes, a pair of punch-shear combination machines and five laser-cutting machines (two fiber lasers and three CO2 machines). Immediately catching the eye of those who tour Tecnolaser, however, is the Salvagnini Traystore. This automated material-storage and retrieval system features some 1000 trays of varying sizes, grades and gauges of sheet (3000-ton capacity) to keep the sheetmetal flowing to and from the shop’s laser-cutting machines and to its punching-shearing operations. 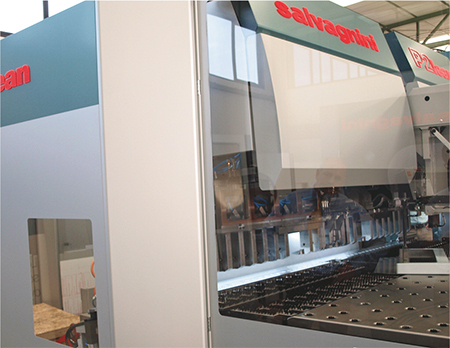 Its latest Salvagnini acquisition is a Model L5 3-kW fiber-laser cutting machine, installed early in 2014. Brought on to take over work from an aging 2.5-kW CO2-laser model, it joined an L3 machine (2-kW fiber source) installed in 2010. Tecnolaser fabricates, we were told, 600 tons of galvanized and stainless-steel sheet per month. Management particularly favors its fiber-laser machines for taking on galvanized material, finding that cut-edge quality is more consistent than with a CO2 laser. Also in action was a panel bender, Model P4Xe-2116, installed in 2012, which we were told can form parts in 2 min. that used to take 25 min. to form on a press brake. 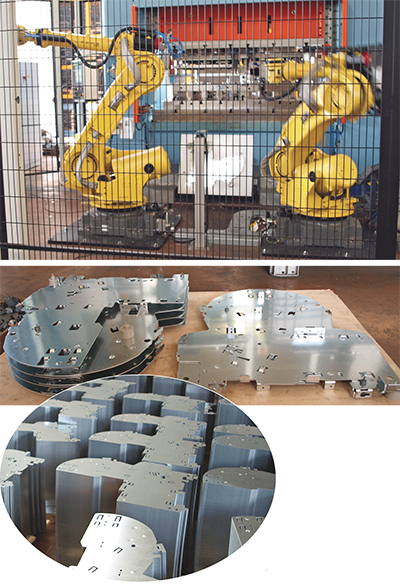 From cutting and forming equipment designed primarily for sheetmetal and plate 1 in. 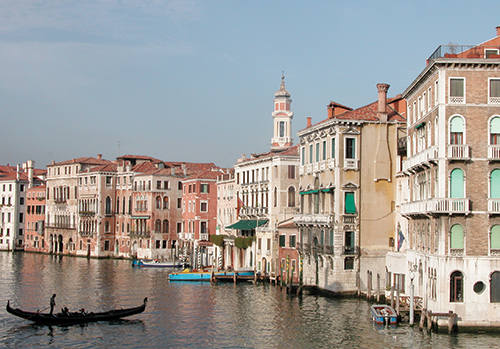 thick and thinner, our attention next turned to the heavy stuff with a trip to the Adriatic-seacoast town of Cesena. Here we visited Promau, which manufactures the Davi line of plate and angle rolls. Davi, Inc. president Alex Soffritti and North America area manager Matteo Rossi provided Andy and me with a lesson in geometry. Specifically, we learned how the firm’s recently improved plate-roll machine provides increased capacity at no increase in purchase price. The firm will introduce its newly minted plate-roll lineup at FABTECH. The new machine lineup, dubbed MAV (three-roll machines) and MCB (four-roll machines) boasts a new, sturdier yoke design that keeps the rolls more stable under load, explains Soffritti. This enables more efficient power transfer through the frame and to the workpiece. Also, the frame of the machines has been redesigned to better-integrate the base of the frame, “and better transfer stresses during forming to minimize deflection,” he adds. The result is a 10-percent increase in material-thickness capacity with no increase in tonnage, or purchase price. MAV rolls cover the material-thickness range of 1 to 12 in. A self-aligning and tilting top-roll housing (compared with a conventional rigid housing) tilts the top roll more than 4 in., allowing fabricators to quickly and accurately form large angles on heavy cones. And, explains Soffritti, the machine is designed so that cylinders pull down the top roll to press it down onto the workpiece, rather than push the roll into the plate. This design avoids physical deflections or mechanical backlash of the frame, optimizing accuracy, says Soffritti. The newly upgraded MCB lineup of four-roll machines features 12 models with material-thickness capacity from 1⁄4 to 12 in. Unique features of these machines, says Soffritti, include the patented Servo-Tronic synchronized roll-parallel control system; and planetary swing-guide technology, for prebending, that wraps the side rolls toward the center of the machine’s top roll. Compared to more conventional inclined linear guides, the swing guide enables forming of cylinders with tighter radii. Before our visit to Essequattro, Andy and I spent time at CY’s fiber-laser-system production facilities in the city of Schio, including a sneak-peek at its new 5000-sq.-m assembly plant that is more than twice the size of its current assembly plant. We also paid a visit to a local machine shop that serves as one of CY’s primary suppliers of cutting-head parts. “We’re introducing two new cutting heads later this year and in 2016,” says general manager (and son of the company’s founder) Federico Campana. 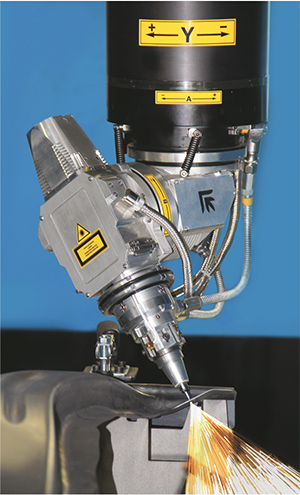 “In 2010 we launched our fourth-generation cutting head for flat-sheet cutting, which featured technology developed to optimize consumable life by isolating the optics from cutting dust and debris. The next-generation head (the Evo I) is more compact and weighs 3 kg less, and provides up to 10 kW of cutting power.” In addition to the new flat-sheet cutting head, CY also will soon introduce a fiber-laser head for tube cutting (the 6-kW-capacity Evo II). CY has a long history in producing laser-cutting machines, dating back to 2004 with a cooperative-development relationship with fiber-resonator manufacturer IPG Photonics. In fact, CY still houses an IPG-equipped lab where the two companies jointly perform research and development. CY sold its first fiber-laser cutting system in 2005 (2 kW), and began marketing to the United States in 2009. In 2011 it received a U.S. patent for fiber-laser cutting systems, and just last year it opened CY Laser America, in Sterling Heights, MI. In addition to the soon-to-be-released sheet- and tube-cutting heads, CY also showed us a couple of new developments for its sheet-cutting machines that will debut at FABTECH. These include a shuttle table with wheels, allowing an operator to move the table around a shop from machine to machine; and a CNC fume-collection device that follows the cutting head to collect fumes directly under the head. Developed by Italian manufacturer Sideros, the setup proves more effective and consumes less energy than the more typical segmented-table design used to collect fumes, says Vanin. Before making our way to Essequattro, we paid a quick visit to a job-shop machining company (NGR). It manufactures CY’s cutting-head components, including those for the soon-to-be-released heads, for which CY predicts to enjoy a large retrofit market. Then we made a quick stop at job-shop fabricator Zanella Snc, in Schio, which acquired and still operates the first fiber-laser cutting system ever manufactured, says area sales manager Federico Zocche. The fabricator employs the 2005-vintage machine, with 1.5-kW laser, to produce parts not only for several job-shop customers, but also for its own brand of barbecue grills. At Essequattro, in the small Italian town of Grisignano di Zocco, we then saw a beautiful display of how laser cutting turns sheetmetal—primarily stainless steel and brass—into works of art. With its 2-kW fiber-laser setup, the firm cuts stainless sheet to 6 mm thick. Bringing the work inhouse, explained Zoppelletto, not only streamlines production but it also makes the firm more responsive to the whims of the architects serving its high-end retail clientele. Essequattro operates its CY cutting machine over two shifts, and it can run lights-out if necessary. To do so, Zoppelletto employs a special control-panel extension that resides on his laptop computer. A closed-circuit camera mounted to the cutting machine allows Zoppelletto to monitor lights-out production. Andy and I found the whirlwind tour of Italian machine-tool manufacturers and their fab-shop customers extremely enlightening and educational. And, all of our hosts were very gracious and forthcoming. So, many thanks to all of the companies we visited with, and to the Italian Trade Commission for its support.